Today I pretended to be a professional working in the field of internet security just so I could sneak a peek at one of NYC’s most isolated Starbucks. 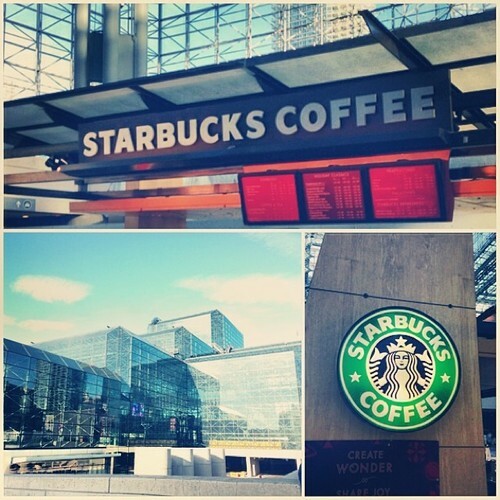 I’m referring to the small Starbucks stand inside the Jacob K. Javits Convention Center off of 11th Avenue in Midtown. What you see pictured above is an enormous glass plated convention building right near the Lincoln Tunnel to Jersey. I’ve been staring at that one isolated dot on the Starbucks App for quite some time — wondering exactly what was all-the-way out there on 11th avenue besides gas stations and drive-thru McDonalds. And as I approached the massive convention center on my Citi Bike, it seemed weird that I’d never spotted this building before. Albeit it is in Hellsea — the neighborhood of traffic jams and construction — but it’s also right up against the West Side Highway in an area I’ve biked up and down countless times. How’d I miss the giant glass building? Once I parked my Citi Bike at the corner of 34th and 11th — very convenient, btw — I followed someone with a conference badge that looked like he knew where he was going. Once inside I was surrounded by hundreds of ISC East convention-goers. I had done some research of the conference and found out that it was all about internet security and cutting-edge programs to keep businesses and programs safe. So, not exactly my cup of tea, and clearly I did not take the steps to register to attend. So I walked around and tried to look like I belonged. First I stumbled upon a small food stand that was serving coffee out of white Starbucks cups as well as some sandwiches and pastries. An amateur may have been fooled by this, but I knew this was no corporate or licensed Starbucks, just as I knew I there was one in the building somewhere, and I was going to find it. So I continued to wonder until a security guard asked me for my conference badge. I played dumb and asked her where the Starbucks was, but she didn’t know. Finally I found two gentleman with authentic Starbucks drinks in their hands and they informed me the Starbucks was on the other side of the building. So I cut around the registration line, bypassed more security guards, breezed by several construction teams — the convention center is apparently under renovations — until I finally spotted the Starbucks branded coffee stand in a mostly deserted area of the building. There was no line — even though stanchions were set up — and the baristas were eager to take my order. I then found a small cafeteria/seating area one floor down from the Starbucks and sat for a moment to enjoy my iced coffee before vacating the Javits Center entirely. 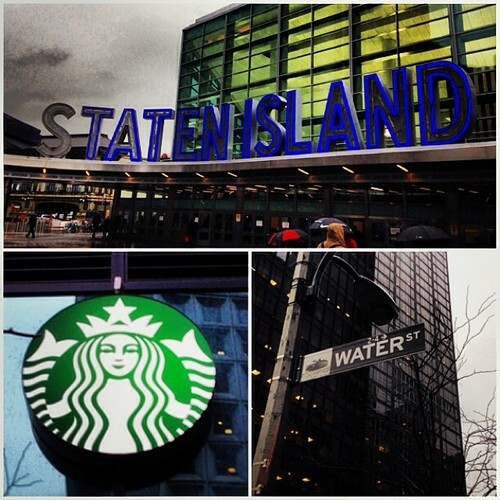 Obviously, this is not the kind of Starbucks that any normal tourist or NYC resident will be interested in visiting. It’s far too isolated from the rest of Manhattan and not easily accessible to anyone not going to a convention of some sort. Still, it is a licensed Starbucks and I had to see it for myself. I think when Howard Schultz and Starbucks Corporate came up with the idea of paying it forward (#payitforward) at its many stores across the nation they left some kinks in the chain. 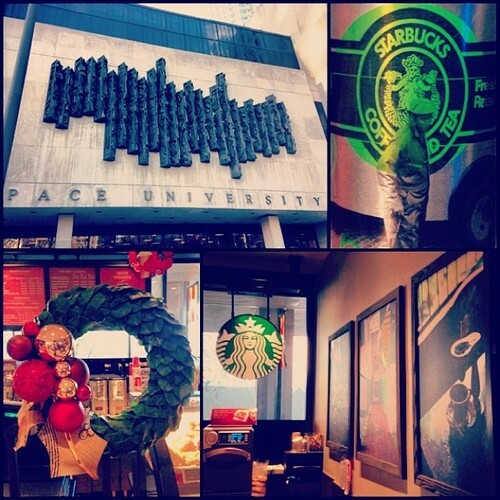 And they simply didn’t account for what a New York City Starbucks environment is really like. Today alone, I attempted and failed, not once, but twice at paying it forward — or backward, really –at two different Starbucks. In case you have no idea what I’m talking about above, here’s a quick overview. This Monday, Starbucks’ CEO Howard Schultz released a letter that urged other successful business CEOs to put the pressure on their representatives and end this government shutdown. Did you know Schultz is a Democrat? How rare for such a successful CEO! 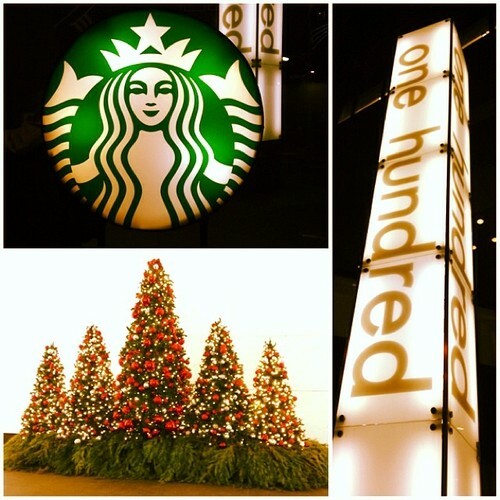 Anyway… Then Wednesday, Starbucks released information on a three-day promotion in an email stating: “Pay it forward. Get a free coffee.” The concept is simple: Come into Starbucks between Oct 9-11, buy someone else their favorite drink (preferably a stranger), and you receive a complimentary tall coffee for your civility. Simple enough, right? When I first heard of this promotion, I thought it was the coolest thing. I love the idea of Starbucks attempting to start a small movement of generosity while our government is currently shutdown due to hostility and greed. But when you put the concept into practice, it doesn’t seem to work as well as it was intended. So my first attempt to pay it forward this morning was thwarted by the simple fact that there was a line in the Union Square Starbucks that was out the door and I was pinched for time. Therefore, no Starbucks for me or any stranger this morning. 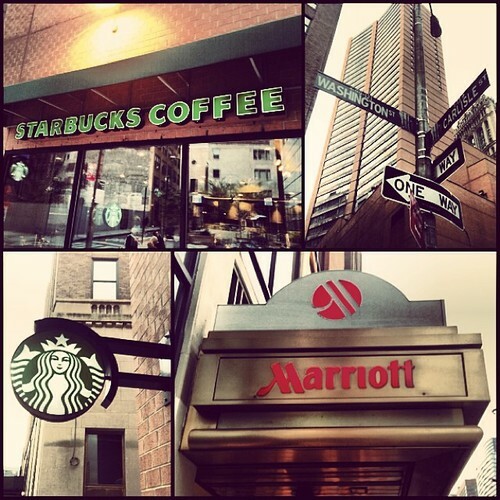 My second attempt was at the Starbucks just outside of the MetLife Building on 45th & Park. I walked into this very small Starbucks and ordered my usual grande iced coffee and waited for someone else to come in. Then a gentleman came in by himself while I lingered at the register. When the barista turned his attention to his new customer, I intercepted and told him that I wanted to “pay it forward” and buy this gentleman’s drink. The barista looked confused, so I went on. Aren’t you guys running a promotion to buy someone else a drink? Still — he looked confused, and the gentleman whose drink I was attempting to buy looked even more confused. So the barista asked one of his partners who looked to be the manager on duty. Still — this man looked confused. The presumed manager went on to tell me that some people have been coming in over the past few days expecting some sort of buy-one-get-one, and he knew nothing about this Pay it Forward promotion. So in the end, the gentlemen whose drink I attempted to buy ended up ordering and paying for 11 dollars worth of food and drinks on his own while I questioned the staff that had no answers for me. 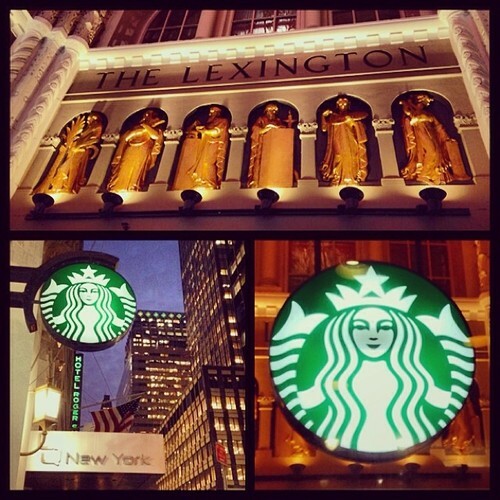 Now, I’m wondering how Starbucks spread the word of this promotion internally? And has anyone had a successful #payitforward experience yet? In New York City? I guess I’ll attempt once more tomorrow. 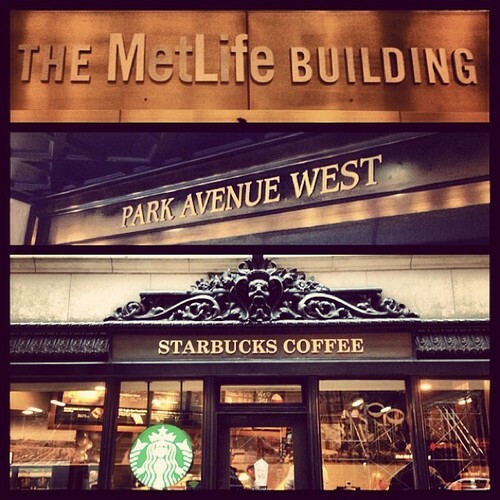 See below for the details on the MetLife Starbucks on 45th & Park. Here’s a small hint to the rating system I have been working with since this blog’s inception. 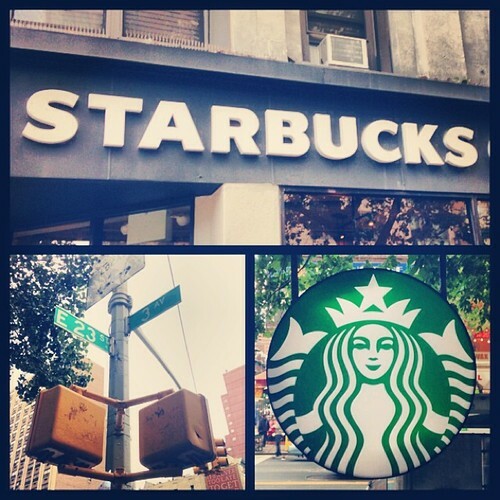 If the only nice thing I can say about a NYC Starbucks is it’s in a good location, then — yea — it’s a 1-Cup Starbucks. 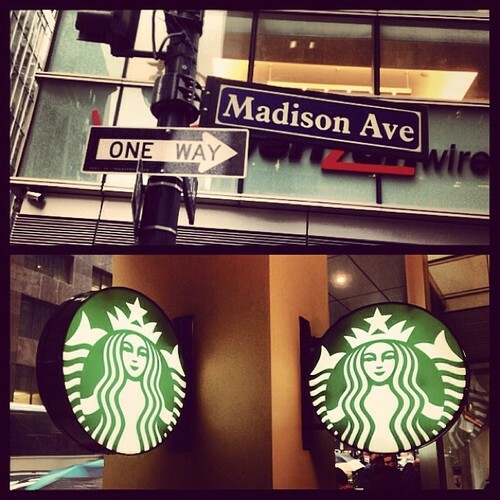 Case in point: The Starbucks on 44th & Madison Avenue. 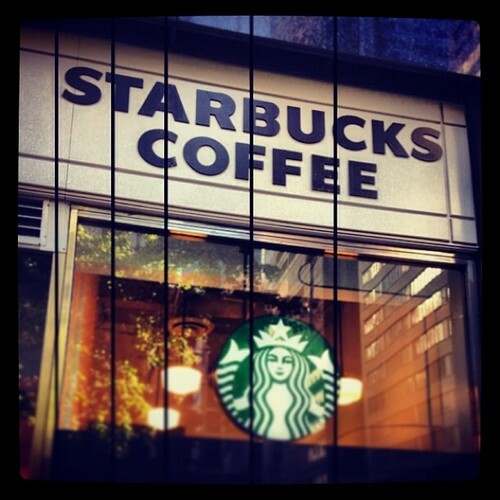 This Starbucks is directly across the best-kept secret Starbucks I visited last Friday. Unfortunately, last week’s Starbucks hides so well, that this one is forced to take the brunt of Midtown traffic — even though it’s much smaller and has one-fourth the seating. The coffee line wasn’t too long, but ironically there was even a line of people waiting for someone to leave the completely occupied seating area. The only thing this Starbucks has going for it is the fact that there’s no restroom, so obviously, the patrons can’t linger forever. An older gentlemen came into the Starbucks with one of those reusable plastic grande cups — stained and battered. Although he didn’t quite look homeless, he certainly smelled homeless. How do I know? Well, of course he sat directly across from me at the same table. In the short time I was there, I witnessed him harass the baristas — apparently attempting to give them a laptop he claimed had a virus on it — unload his bag of colored markers and half smoked cigarettes onto our table, and walk around the tiny Starbucks talking to no one in particular. It’s my theory that NYC makes people crazy. It has a degenerative effect on people’s social skills and literally changes how people act, how they communicate, and how they go about their days. Eccentric may be a more politically correct way to describe the behavior I witness. But I think these habits get worse the longer someone lives in the city. After all, there’s so many people living on this tiny island, that crazy tends to blend in. It makes me wonder how I’ll act 5 years from now? All that being said, I’d like it to be known that I already concluded this Starbucks was only worth 1-Cup long before Mr. Eccentricity showed up. Reason being: It is way too small, way too crowded and offers very few seats. Perhaps if it were more conveniently located or actually offered a restroom it would have received a higher score. But then again, if so, it may attract more kookie characters. That’s all for the moment. Now if you’ll excuse me, I need to wipe off the banana smoothie that my table-mate splashed onto my laptop.